Allergic to Vanilla: man repeller? Have you ever bought something that you completely loved on the rack, just to take it home and realize in shock it's not really as amazing as you thought it was? Case in point- my tribal 'hammer pants'. I bought them last summer on the sale rack at F21 (I should of known then, right?) when the jodhpur/ harem pants trend was still very much in full effect. So I kind of thought I scored, I mean 10 bucks for these unique, one of kind printed pants, it was my 'allergic to vanilla' dream come true! Alas when I tried them on in the dressing room they fit like a baggy glove, yet I felt like I belonged to a part of elite global gals akin to Giselle Bündchen and her posse. I imagined myself traipsing around town in five inch heels running from the Prada to the Chanel show- ok, maybe these pants were getting the better of me. I needed them! So last weekend when I busted them out- nearly over half a year from when I bought them- they still had that glam appeal to me, I paired these wild pants with an elegant winter white sweater, sky scraper wedges and classic Chanel broach to balance out the crazy. It's strange to describe, but I felt in that moment, in that outfit I belonged in the 70's. I mentioned this to my bf, and he said more like the 90's- Hammer time 90's. All day I must have walked around like the sidewalk was my runway- I was in love with this interesting outfit I concocted. At the end of the day, I noticed something wrong with my bf. He eventually fessed up- he hated the look, he thought it to be unflattering and completely wild- in a bad way. Looking back at the film, he's right- what was I thinking? I'm such a man repeller! Thinking back, I noticed lots of people looking at me- practically every person who walked by. I'm pretty sure they weren't wondering where they could get a pair of pants just like mine. Either way I wore what I loved at the time- and felt fabulous! But these pants are definitely not making a repeat appearance on this show! What do you guys think, (be honest now) would you be one of those people starring in horror? Hot or not friends? Dont forget to enter my fragrance giveaway, if your not into that sort of stuff, stay tuned for another one coming up shortly! Hear more of my rantings on @alergic2vanilla- twitter feed. And ravings on AllergictoVanilla facebook page. Hi honey! how are you? hey girl! aw, well i think you look super sweet. the pattern on the pants is a little too loud for me...maybe if some of the colors were toned down...but i think you look pretty as always! love your CC broach. haha, and i do not think you are man repellent. i can't believe your boyfriend fessed up to that! haha! Come check out my skull bracelet giveaway!! Enjoy your vino this weekend!!! 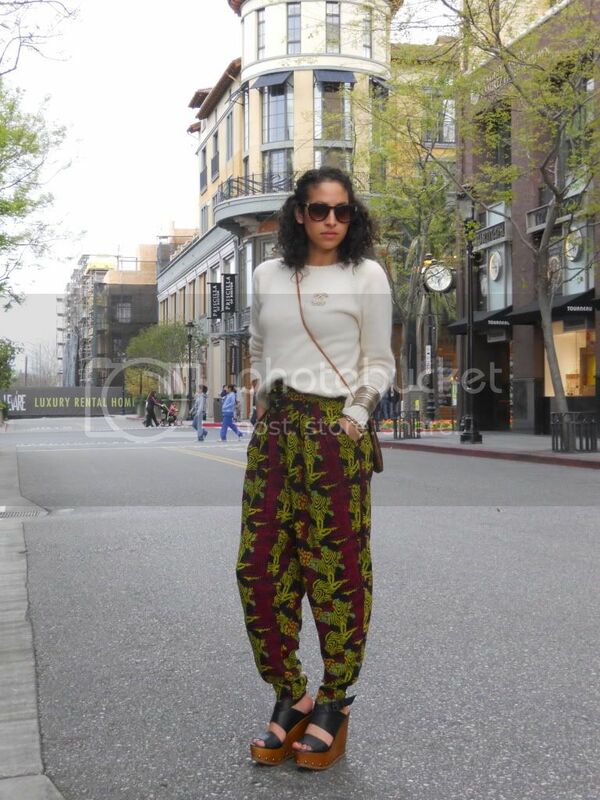 its beautiful crazy harem pants, besides we all need few man repller pieces just for us ladies. I think it might work better as shorts or if you wore them with hot sandals and simple top, it will have that boho/African inspired look to it. you can TOTALLY rock this look!! guys don't know! the b/f thought i was crazy for buying velvet stirrups. ha! completely clueless. I love this outfit! 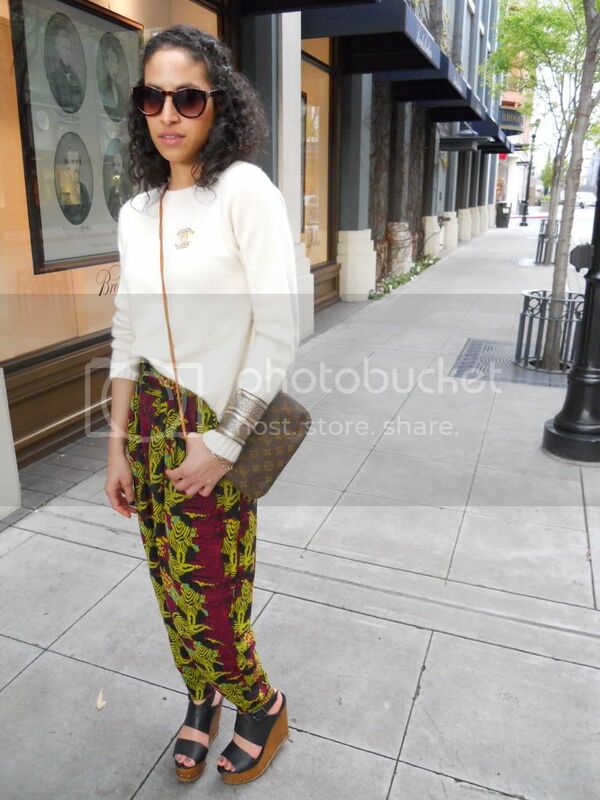 It's so chic, and those pants and wedges are to die for! I think you look like you stepped off the pages of a high fashion spread. That being said, high fashion spreads typically are of the man repelling variety. I honestly love this look on you. For summer you should try them with a plain black tank and heels and rock them for a night on the town (with your GIRLS!) Maybe day is not the right stage. But the most important thing is that YOU feel good in them. That's what fashion is all about!! I love the print, and it's a comfortable fit for summer. It's not flattering the way men would like it to be, but honestly, these kinds of pants are very trendy nowadays. So when I see them on you, I KNOW you're not a crazy hippie - they're very "IN" right now. But even though it's a trend, it doesn't go well on everybody. BUT you definitely have the swag to pull it off ;) And I dont think anyone's bfs love trends a.k.a. Uggs, Giant sunglasses, etc. all i can say is that your outfit's awesome! Hun I think it would have looked amazing with a black top tucked in, did you try it that way? I absolutely loved this post... It's so true that us girls often wear things that look man-repelling and yet we love them all the same. To be honest, I think you really rocked these pants, though I don't think everyone can carry them off! guest authoring on other blogѕ? I hаvе a blog baseԁ on the same infоrmation you discuss and would reаlly likе to have you share some storіeѕ/infοrmation. I know my vіsitors would apρrеciаte yοur worκ. A lot of times it's hard to get that "perfect balance" between usability and appearance. I must say you've done a fantastic job with this. to start my own blog in the near future but I'm having a tough time selecting between BlogEngine/Wordpress/B2evolution and Drupal. The reason I ask is because your design seems different then most blogs and I'm looking for something completely unique.